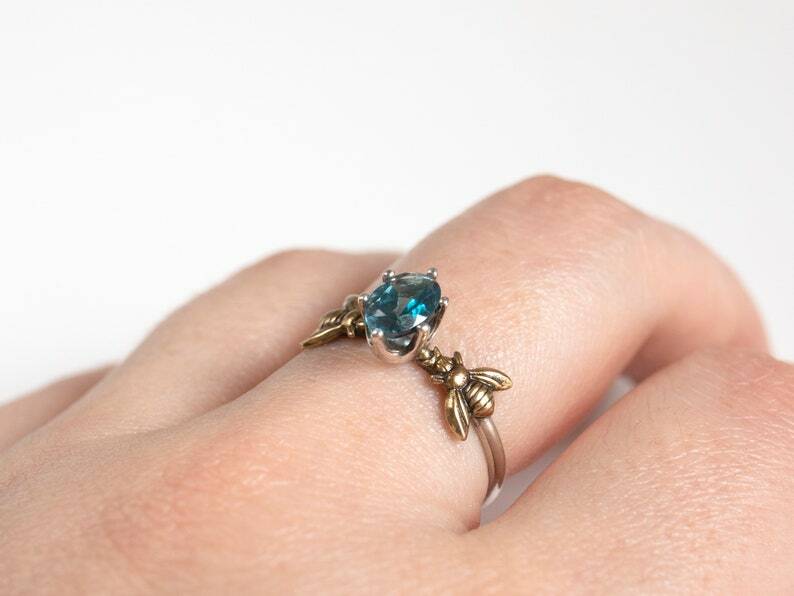 5 x 7mm natural London blue topaz stone in a solitaire setting. Requests for all other gemstones are welcome! Other options linked below and shown in later photos above. I craft the sterling silver ring band and mount for each of these using traditional silversmithing techniques, then solder on the tiny brass bee stampings to flank the stones. After I am pleased with the ring, I prong-set your topaz. With each one being fully hand-made from start to finish, they are not completely flawless and perfect, but rather each has character! Topaz are relatively durable stones, though you should still exercise care when wearing. I recommend you remove before exercise, bathing, or swimming. Took a little while for it to get here but my girlfriend absolutely adores it :) the only problem is that the little bee wings hook on everything!! Blankets, pants, shirts, even underwear!! :'( She bent one of the little wings within an hour of on a blanket and was super sad. I was able to bend it back into shape with some pliers wrapped around my shirt. I wish the little wings were a little more tucked into the body of the bees so it didn't catch on everything.